구글은 때론 엄청난 검색결과를 호박째 준다. 오늘 검색은 '박장대소'를 영어로 어떻게 말할까였다. '안 되겠다' 하고, 구글 검색창에 '박장대소'를 검색했다. 다시 '박장대소 영어로 어떻게'를 검색했다. 이젠 '박장대소하다 영어로 어떻게' 로 검색했다. 내가 입력한 단어를 굵은 글씨로 변환해서 보여준다. 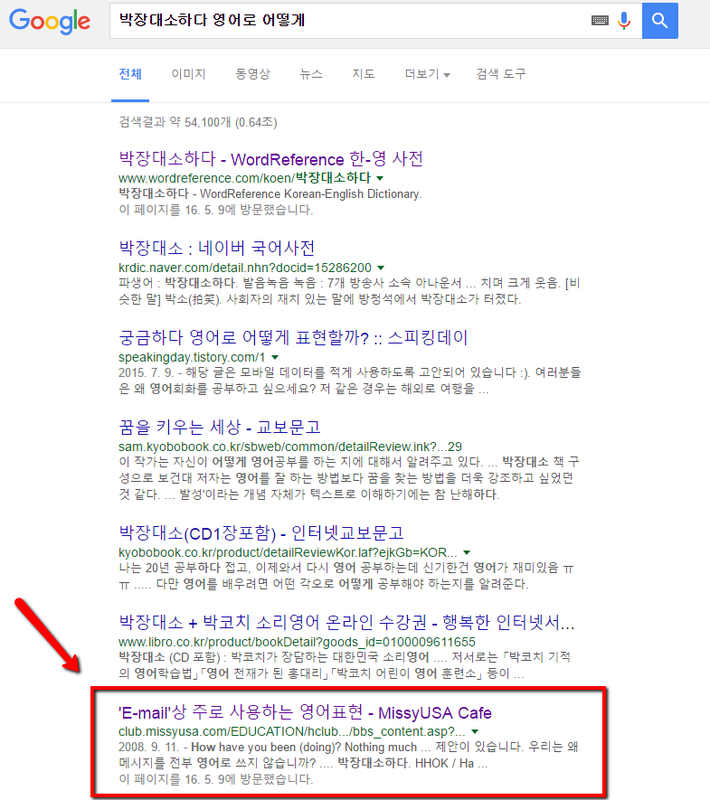 E-mail상 주로 사용하는 영어표현? 2008년 자료다. 영문 이메일은 영문 편지와 차이가 있단다. 그리고 자신이 오랜 작업 끝에 정리한 글이 올라와 있다. 너무 유용한 자료라서 전문을 게시한다. 구글 덕분에 유용한 영어표현을 알게 되었다. 아. 박장대소는 영어로 guffaw 라고 한다고 나중에 구글이 알려주었다. I'm sending this mail from Seoul, Korea. This is my first mail to send to this mailing list. 이 메일링리스트에 처음으로 메일을 보냅니다.. I work for a multimedia company that makes educational software. 교육용 소프트를 만드는 회사에서 근무하고 있습니다. I am Bnghee Han from Daejeon-City, Korea. 한국의 대전시에서 살고 있는 한 봉희라고 합니다. How have you been (doing)? Nothing much new here. I'm happy to join this movie lover's mailing list. 이 영화 동호인 메일일 리스트에 가입되어 영광입니다. I sent e-mail to you last weekend but I guess I sent it to the wrong address. 제가 지난주에 메일을 보냈습니다만 잘못된 주소에 보낸 것 같네요. Thanks for your quick reply(Response). Thank you for your e-mail dated April 15, 2001. 2001년 4월 15일자 메일 고맙습니다. If you could take a few minutes to answer our questions, we would really appreciate it. 저희들의 질문에 시간을 조금만 내서 답변을 해 주신다면 감사하겠습니다. Sorry I didn't write to you earlier. 좀 더 빨리 쓰지 못해 죄송합니다. I apologize for not having gotten into contact with you sooner. 좀 더 빨리 연락을 드리지 못해서 죄송합니다. Sorry for any confusion and it is a pleasure doing business with you. 혼란스럽게 해서 죄송합니다. 그리고 당신과 비즈니스를 같이하게 되어 기쁩니다. I'd like to make a proposal: why don't we write our messages all in English? 제안이 있습니다. 우리는 왜 메시지를 전부 영어로 쓰지 않습니까? Are you interested in going to a baseball game with me this weekend? 이번 주말에 저와 야구하러 가는 것에 관심이 있습니까? Why don't you stop by Korea if you are coming to Japan? 일본에 온다면 한국에도 들러 주세요! Does anyone know if those movies are available on videotape? 이러한 영화가 비디오테이프로 가능할지 누가 모릅니까. 언제 답장을 받아 볼 수 있을까요!. I just want to check if you have received my mail of April 23rd. 4월 23일날 보낸 나의 메일을 받으셨는지 확인하고 싶습니다. Is there anybody out there who has the last month's English Network? 누군가 지난달의 영어네트워크를 갖고 계시지 않습니까? I am responding to your job opening announcement in the Korea Times dated April 5th. 4월 5일자의 코리아 타임즈 구인 광고 건으로 연락하고 있습니다. Here is my answer to your question of April 1st. 4월 1일자의 당신 질문에 대한 답변입니다. I wish I could go, but I have already made plans on the 12th. 갈 수 있으면 좋겠습니다만, 벌써 12일에는 계획이 있습니다. I hate to ask you this, but would it be possible for us to stay with you? 이러한 것을 부탁드리기가 싫지만 당신과 함께 머무르는 것이 가능할까요? Let me know the results of your entrance exams in the next mail. 다음 메일로 입시의 결과를 가르쳐 주세요. Could you help me with my survey? 나의 조사에 답해 주실 수 있겠습니까? I am looking for key-pals in Mexico, Spain or South America. 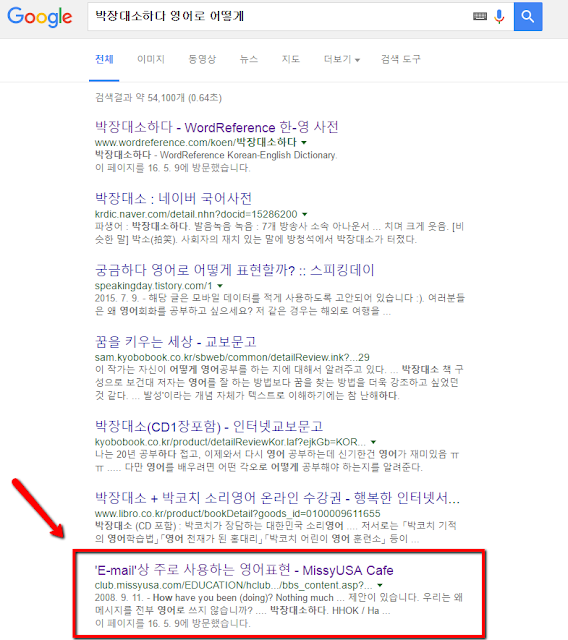 멕시코와 스페인과 남아메리카에서 전자메일로 펜팔할 상대를 찾고 있습니다. We would like to e-mail with an elementary school class in Italy. 이탈리아의 초등학교 클래스와 전자메일을 교환을 하고 싶습니다. Did you mention you wanted to start this business by March this year or March next year? 이 비즈니스를 금년 3월까지 시작하기로 언급했습니까? 아니면, 내년 3월까지라고 언급했습니까?. Did you also say we need a unix machine for this? 당신은 또한 UNIX의 컴퓨터가 필요하다고 말했습니까? I'm a bit disturbed by your reply to our new product. 저희들의 상품에 대해서 당신의 답변에 놀랐습니다. I'm so glad/happy that you liked our gift. 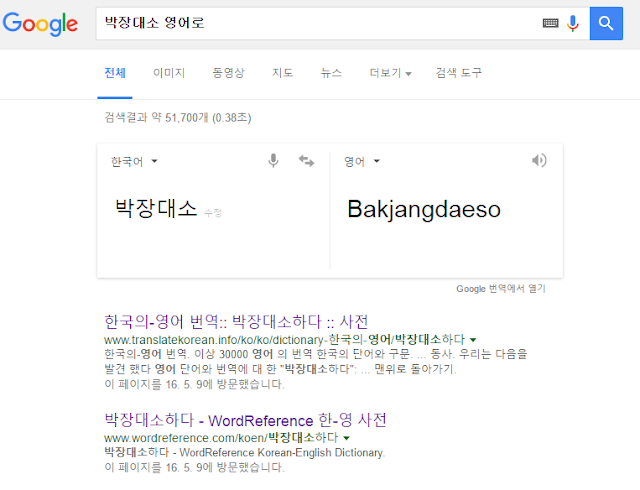 당신이 우리의 선물을 좋아하시니 기쁩니다. I'm terribly sorry to hear of Dr. Johnson's sudden death. 죤슨 선생님의 갑작스런 죽음을 듣고 놀랐습니다. 명복을 빕니다. I wish you the best of luck /good luck with your final exams. How are you feeling? I heard you couldn't come to work for several days because you got sick. 상태는 어떻습니까. 병이 들어 몇 일간 출근을 못한다고 들었습니다. Have a good rest until you feel completely well. 완전히 좋아 질때가지 충분히 휴양을 취하세요. I'm really glad to hear you got promoted. You deserve to get promoted. E-mail me or call me collect, please. 당신으로부터 빠른 답장을 기다리고 있습니다. I'm looking forward to receiving your reply at your earliest convenience. 가능한 한 빨리 답장을 받을 수 있기를 학수 고대하고 있습니다. Please send responses by the end of April. I'll tell you more about it in my next message. 다음 메일로 좀 더 이야기를 하겠습니다. Please give my best regards to your boss. 당신의 상사에게 안부 전해 주십시오. 아래는 e-mail에서 자주 나오는 약어의 예다. 지는 너무 자주 사용하는 것은 권장하지 않지만, 읽었을 때 어떠한 의미인지 정도를 이해할 수 있도록 알아두자. 그리고 한 두개 정도는 이메일에 사용해 보아도 좋을 것이다. IITYWTMWYKM / If I Tell You What This Means Will You Kiss Me? HHO 1/2 K / Ha, Ha, Only Half Kidding　좀 농담을 했다니까! KISS / Keep It Simple, Stupid　간단하게 못하니, 바보야! RTFM / Read The F*cking Manual! / Read The Flaming Manual! 메뉴얼을 읽어라. HAK / Hugs And Kisses　(꼭 껴안고 키스해줄 정도로) 훌륭하다! HHOK / Ha, Ha, Only Kidding　농담이야. ONNA / Oh No, Not Again　좀 기다려요. HTH / Hope this Helps! 이것이 도움이 될거야! 감정을 그림 문자로 표현하는 마크도 생략 기호의 하나이다. 적절히 사용하면 매우 효과적이다. 많이 사용하는 것을 모아 보았다.